The nomination of James Mattis as Secretary of Defense briefly brought the often overlooked concept of civilian control of the military to public attention. Commentators debated whether Mattis’ qualifications, personality, and presumed influence on the administration justified an exception to the law prohibiting recently retired generals from serving in that post. Reassuringly, in that discussion as well as in the larger conversation about the unusual number of retired and acting general officers now serving in traditionally civilian posts, there has been no discernible challenge to the notion of civilian control of the military. Yet underneath this consensus as to the desirability of civilian control, hide differences in understanding about what it actually entails. In short, we want civilian control but do not precisely know what it is. That haziness in understanding is partly due to semantic imprecision: civilian control denotes a singular entity but there are actually several different strands. This sets the trap for the unwary, who might mistakenly believe that because they understand one element they have grasped the entirety of the subject. The other major difficulty is that the origins of the American understanding of civilian control reside in the Early Republic. There are some today who regard everything from that time as inviolate and enduring. Originalism might be justified in some areas, but because the size, composition, capabilities, and purposes of the defense establishment are so radically different now than then, the Founders’ vision of civilian control is only a starting point. We must think for ourselves. Fortunately, most Americans have little reason to think about the matter of civilian control. Strategists, however, often operate at the nexus of civilian and military, and so it is worth taking the opportunity of the present discussion to reflect on the nuances of the subject. Mattis’ military background is thus incidental in the matter of control among various civilian power centers. Indeed, perhaps the foremost champion of this sense of civilian control—Senator John McCain—is a retired naval officer and son of an admiral who supports a former general as secretary of defense on the presumption that he will modify and perhaps even resist the policies of a president who has not served in the military. Though the situation is a feast for those who enjoy irony, the essential point is that the military background (or lack thereof) is largely beside the point in the check-and-balance aspect of civilian control. After the determination of which civilians, comes the question of what it is that they should control? President Harry Truman’s dismissal of General Douglas MacArthur is the most dramatic instance of civilian control in American history, but that atypical moment exerts a disproportionate influence over the popular understanding of the subject. Only the barest fraction of civilian control relates to presidential direction of policy, and so even the absolute faithful adherence to such commands would still leave open many questions of civilian control. Far more common—it occurs on a nearly daily basis—is the mingling of what might be termed political control over the executive with civilian control of the military. This aspect of civilian control is concerned with the Department of Defense (DoD) not in its unique role as the means for organizing military power but in its generic role as one of many departments of the government. Every action (or instance of inaction) by a governmental department is political in the raw sense of politics being the resolution of competing interests and the allocation of advantages and burdens throughout society. DoD is inescapably political due to the massive scale of its activities, which inevitably produce consequential differences between winners and losers: which firms receive contracts; which communities have installations; which groups have access to the benefits of military service or conversely carry the liability of forced service in wartime. Some of the most frustratingly cumbersome systems governing the military, such as the acquisition and procurement system or the base realignment and closure process, are products of this sense of civilian control; their purpose is to ensure that decisions are made on the basis of rigorously applied criteria rather than which company or community has the most aggressive and influential political sponsor. Yet inevitably the impartial criteria contain political choices, such as what percentage of defense contracts should go to small American businesses. In this most common form of civilian control, the military is an interest group advocating for the most effective organization against competing economic, social, regional, or ideological considerations. In this political aspect of civilian control, Mattis’ military background might be more of a problem for DoD than American democracy. Presumably, the president selected a former general with the intention of giving more weight to military considerations. If so, then any greater indifference to non-security factors is the legitimate consequence of an election rather than a failing of civilian control. But the president’s opinion is not the only one that matters. While even some legislators are critical of a perceived congressional abrogation of responsibility in what might be termed civilian control of military policy, there is no lack of legislative input into civilian control of military politics. Congress actively participates in the allocation of the benefits and burdens of defense. As the chief political appointee in DoD, the secretary of defense is the lead advocate for the interests of national defense, a role that might be best played by an outsider with stronger ties to other politicians. For instance, Secretary of War Elihu Root had no military experience, but his success in pushing military reform through Congress in the early twentieth century is widely considered a seminal moment in history of the U.S. Army. [iii] Of course, a political background is no guarantee of effectiveness as demonstrated by the tenure of former senator Chuck Hagel. Yet that example only underscores the difficulty of navigating the political waters. A former general as secretary of defense poses a different set of problems for the more intuitive sense of civilian control, that over military policy. This was naturally the focus of much of the discussion concerning the wisdom of the Mattis appointment. It is possible that the public’s high regard for general officers could create the political space for him to disregard presidential direction to some extent; that this is the outcome that some members of the president’s own party seem to wish for is a sign of the bizarre complexity of civilian control. But it is also possible that Mattis might be an unusually effective tool of civilian control in that he is immune to the risk faced by civilians who overrule best military advice, and thus create a potentially powerful weapon for their political opponents to turn against them. More broadly, Mattis’ expertise could allow him to press the military more forcefully and effectively on behalf of the president. In one of the seminal works on civilian control—Supreme Command—Eliot Cohen celebrated the role of strong civilian wartime leaders including President Abraham Lincoln, who often sent direct messages to generals in the field from the White House telegraph office. Today, the means might be a video teleconference but the essence is no different: the commander-in-chief gives an order and it must be obeyed. The great difference between the Civil War and the present is the growth of the mechanisms of civilian control underneath the president. The staffs of Lincoln’s War and Navy Departments were organizational pygmies compared to their present counterparts. The growth in the apparatus of institutional control reflects several factors: the expansion of national ambition with the concurrent maintenance of a larger military establishment on a permanent basis, the complexity of generating and sustaining modern armed forces, expansion during periods when civilian policymakers doubted the wisdom or objectivity of best military advice, and more generally, the growth of the federal government . These same factors have allowed a related trend—of which Cohen is an excellent example—of the creation of a civilian defense establishment split among academe, think tanks, and government posts in intelligence or defense. Aside from the diplomatic service, there was nothing similar to this in the United States before World War II. That war, however, mobilized intellectual energies and the Cold War sustained their use at a sufficient level to allow figures like Henry Kissinger, Thomas Schelling, and Albert and Roberta Wohlstetter to devote a career to addressing strategic problems. In addition to Cohen, more contemporary examples are Robert Gates, Michèle Flournoy, and Michael O’Hanlon. Naturally, these civilians bring a different perspective to the formulation of policy and strategy. Unlike the atypically homogenous mixture of experiences and qualifications created by the military career structure, these civilians have widely varied backgrounds and so defy easy generalization. Many civilians have academic credentials in security-related subjects superior to those of the average military officer. Similarly, civilian defense professionals typically have more experience “within the beltway” than a military counterpart of the same age. Conversely, though a significant proportion have “field” experience with the military, intelligence, other government departments, or non-government organizations, they typically have less than their peers in uniform. In these tentative generalizations, those prone to stereotype might see either side of a caricature, the corrosive nature of which was most evident during Robert S. McNamara’s tenure as secretary of defense. The civilians regarded the military as mediocre minds unable to rise above the tactical and operational realm, and unwilling to concede how often best military advice has failed. The military regarded the civilian “whiz kids” as ivory tower theoreticians with little grasp of reality. The two sides were united only in their appreciation of the other as arrogant. [iv] Yet for all of these “tribal” distinctions, when compared with the range of foreign policy opinion among the larger American public, the concerns and views of military and civilian security professionals generally occupy the same spectrum—an area bounded by the difference in opinion expressed in an average edition of Foreign Affairs. Thus, the derisive description of the national security elite as “the blob” is apt in the sense that there is now a complex intermingling of civilian and military staff among numerous power centers: the National Security Staff, Office of the Secretary of Defense, Joint Staff, combatant commands, military department secretariats, and service staffs. Whether led by a political appointee or a uniformed flag officer, virtually all are staffed by some combination of civilians and military in varying proportions. It is not uncommon for a military officer to transition from a position in one organization devoted to the creation of military strategy to another responsible for exercising civilian control by way of policy, or vice versa. The same is true for civilian security professionals, who might serve directly within notionally military organizations or indirectly through work in a think tank or consultancy. This interchange is a good thing; organizations devoted to dealing with complex issues almost invariably benefit from a diversity of background. Nonetheless, the intermingling might cause one to wonder whether civilian control has lost some of its meaning. To an extent, the organizational composition is irrelevant; only the identity of the figure in charge matters. Presidential appointees and their organizations are tools of civilian control; organizations led by military officers are the controlled. Yet the creation of several tiers of appointees—under secretaries, assistant secretaries and principal deputies—makes the actual exercise of civilian control a bit more complex. Before World War II, civilian control over operational and strategic matters resided in the secretaries and assistant secretaries at the top of the two military departments, and they—for want of an alternative—relied heavily upon their supporting military staffs. In short, a thin layer of civilians acted through a relatively unified department staff. Today, several layers of civilians within greatly expanded secretariats exist alongside the military staffs, with many issues falling whole or in part under the purview of multiple civilian and military offices. The question thus becomes how to update notions of civilian control so that these layers might interact in a way that enhances security, enhances accountability of both civilian and military leaders, and remains true to the spirit of American democracy? In Supreme Command, Cohen exposed many of the flaws in Huntington’s preferred model, but his alternative of the “unequal dialogue” between civilian and military leaders is most applicable at the highest levels. [vi] The dialogue between the president and secretary of defense on one hand and the Joint Chiefs of Staff on the other is clearly unequal, but the degree to which the formulation holds at lower levels of the bureaucracy is less evident. When disagreements occur between civilian secretariat and military staff, all parties are typically representing higher officials who are properly acting to discharge their given responsibilities. If the divide between “policy” and “operations” were more evident this would be easily resolved; in that case, the civilian voice would properly predominate. But in many instances, a clear division between the two might not be evident. Policy cannot be formed without dictating operations, and best military advice cannot be formed without advocating policy. The situation is even more muddied when it is impossible to even identify distinct “military” and “civilian” views. For instance, is civilian control at stake when the Office of the Secretary of Defense and a combatant command are aligned on an issue in opposition to a service secretary and chief? The homogenization of “the blob” has led to a situation in which the old adage of “where you stand, is where you sit” is often a better guide to behavior than whether an individual wears a suit or camouflage. The recent dispute between then-Secretary of Defense Ash Carter and Secretary of the Navy Ray Mabus over future force structure demonstrates that this behavior is seen even amongst the highest levels of political appointees. If such divergence is possible among those who can most plausibly claim to be instruments of civilian policy due to their proximity to democratically elected leaders, what then of the dozens at the lower tiers? If they are simply reflecting a mixture of personal and organizational views no different than that of their military counterparts then there is no logical basis for giving those views special consideration. One might conclude that it would be better to simply create a large combined staff, returning to the days of a thin level of civilian control over a (relatively) unified bureaucracy. As tempting as the promise of greater efficiency might be there are two major reasons to maintain the network of political appointees and robust secretariats. The first is that DoD remains a department of the government, and so still requires political appointees to make political issues. Though the Under Secretary of Defense for Policy is one of the most visible positions, most appointed positions—particularly within the military departments—relate to issues that govern the interactions of military and society: acquisitions, personnel, infrastructure. When decisions in these areas seem to favor economic, social, or ideological factors more than national security, there is often grumbling within the military about the negative influence of politics. Yet, ultimately it is in everyone’s interest that the demands, burdens, and benefits of the military remain within the bounds of public tolerance. Those tensions cannot be wished away. If political appointees were not performing the management of these tensions, then senior military leaders would to an even greater extent than they do today. Second, a cohort of political appointees proportionate to the size of the military enhances trust. This might seem counterintuitive, as the presence of civilian “minders” suggests mistrust. Indeed—though neither side would embrace the term—there is an element of political “commissar” inherent in these positions. Despite the negative connotations of the term, in small doses commissars are a good thing. I witnessed this first hand during the unique comparative experience of having served on the personal staff of an American service secretary during the 2014 Quadrennial Defense Review and then in virtually the same job (albeit as an exchange officer) for the service chief during the United Kingdom’s 2015 Strategic Defence and Security Review. Unlike in DoD, the British centralize their equivalent of political appointees (the group of ministers) at department level; in the UK, the service chiefs are the head of their organizations. [vii] Undoubtedly, the majority of American service chiefs would embrace a similar organization that allowed them to be a decider rather than an advisor as they are now. Yet, I think the American model benefits the military over the long run. I sensed a greater level of mistrust between the British ministry “Head Office” and single services than between the American OSD and military departments. That impressionistic perception is based on an admittedly limited viewpoint. Moreover, the difference between the two processes was a matter of degree and should not be overstated: both exhibited elements of bureaucratic tension and cooperation. Nonetheless, it seems logical that there would be less mistrust when “one of your own” is at the top. Certainly, the presence of political appointees is no panacea. One obvious hazard is that the presence of more political appointees simply moves civil-military friction further down the organizational ladder. But there is also the possibility that if the commissars are perceived to be failing in their role then mistrust might move upward, creating divides among civilian policymakers. This occurred during the Obama administration, beginning with the 2009 Afghanistan review. The perception that Secretary of Defense Gates was part of a Pentagon effort to “box in” the president, fed a rift between Pentagon and White House rather than between military and civilian. [viii] This problem would continue due to perceptions that Gates’ successors had either “gone native” (Leon Panetta) or were not up to the job (Hagel). This was in marked contrast to the tenure of Secretary of Defense Donald Rumsfeld during the George W. Bush administration. Though rarely cited as a positive example of civil-military relations, it was at least of the narrow sense that there was never any perception within the White House that it needed to exert additional control because Rumsfeld was a captive of senior military officers. [ix] Whatever his other failings, Rumsfeld’s fealty was never in doubt. The conclusion to be drawn from these examples is not that one side or the other is invariably right or that tension between senior civilian and military leaders is an inherent good; both instances were a regrettable state of affairs. Instead, the lesson is high-level political appointees play a valuable mediation role when they occupy a space between the military and the public. Though this invariably leads to some “tactical losses” (at least from the viewpoint of the military) on the whole it leads to a more healthy relationship between DoD and the society that it serves. As strategists take the long view, they should find civilian control—in all its forms—a positive thing. J. P. Clark is an active duty army officer and the author of Preparing for War: The Emergence of the Modern U.S. Army, 1815-1917. He is a member of the Military Writers Guild and a featured contributor for The Strategy Bridge. The views expressed in this article are those of the author and do not necessarily reflect the official policy or position of the U.S. Army, DoD, or the U.S. government. Header image: William Howard Taft and Elihu Root in 1904. 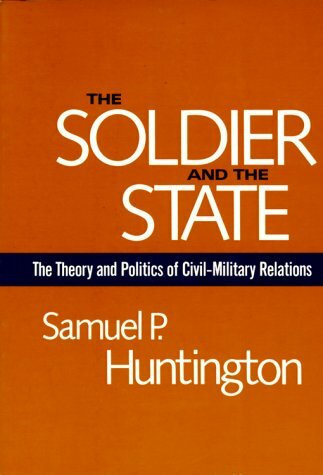 [i] Samuel P. Huntington, The Soldier and the State: The Theory and Politics of Civil-Military Relations (Cambridge, MA: Belknap Press of Harvard University Press, 1957), 80. [ii] Richard H. Kohn, Eagle and Sword: The Federalists and the Creation of the Military Establishment in America, 1783–1802 (New York: Free Press, 1975), 2–88. [iii] J. P. Clark, Preparing for War: The Emergence of the Modern U.S. Army, 1815-1917 (Cambridge, Mass. : Harvard University Press, 2017), 182-196. [iv] For particularly useful books in understanding the various perspectives, see H. R. McMaster, Dereliction of Duty: Johnson, McNamara, the Joint Chiefs of Staff, and the Lies that Led to Vietnam (New York: Harper Perennial, 1997); Alain C. Enthoven and K. Wayne Smith, How Much Is Enough? : Shaping the Defense Program, 1961-1969 (New York: Harper & Row, 1971; Santa Monica, CA: RAND Corporation, 2005). [v] In fairness, it should be noted that Huntington recognized some of the most significant civil-military relations challenged posed by the 1947 reorganization. Yet his formulation of the problem still hinged upon a too restrictive conception of expertise. Huntington, Soldier and the State, 345-466. 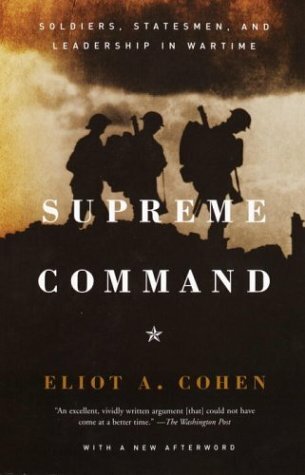 [vi] Eliot A. Cohen, Supreme Command: Soldiers, Statesmen, and Leadership in Wartime (New York: Free Press, 2002), 1-14, 208-248. [vii] There is an additional check on the British military in the form of the Civil Service, which has a stronger role and quite different culture than its American counterpart. Yet British civil servants are also a check on the politicians as well, so the situation is somewhat more complex than civilian versus military. For an excellent summary of the “tribal” dynamic within the Ministry of Defence, see Christopher L. Elliott, High Command: British Military Leadership in the Iraq and Afghanistan Wars (London: Hurst & Co, 2015), 35-83. [viii] Robert M. Gates, Duty: Memoirs of a Secretary at War (New York: Alfred A. Knopf, 2013), 359-385, 586-588.